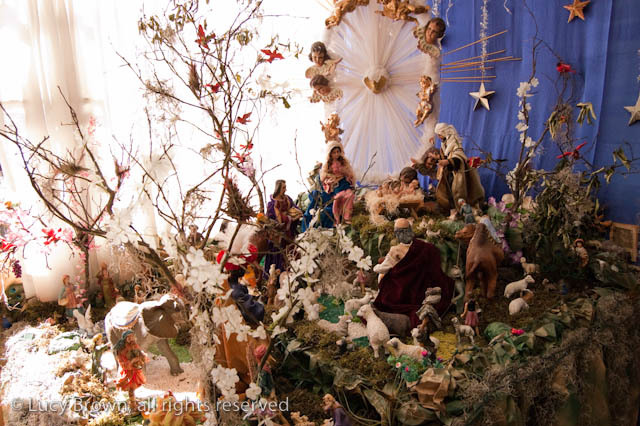 A tradition brought over to Guatemala by the Spanish Hermano Pedro is the nacimiento or nativity scene. 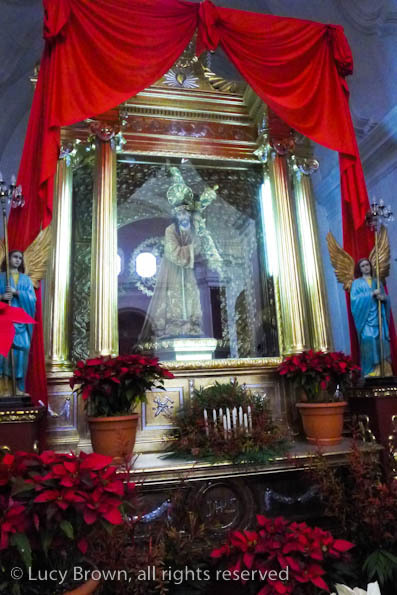 El Día de la Virgen de La Concepción, on the 8th of December, is officially the beginning of the Christmas season and nacimientos start appearing in churches, homes, offices, restaurants, hotels and even in the streets. Guatemalans take great pride in their nacimientos and many of them are brilliant works of art using vividly tinted sawdust (aserrín), pine needles, chamomile fruits (manzanillas) and incense to create color and aroma. 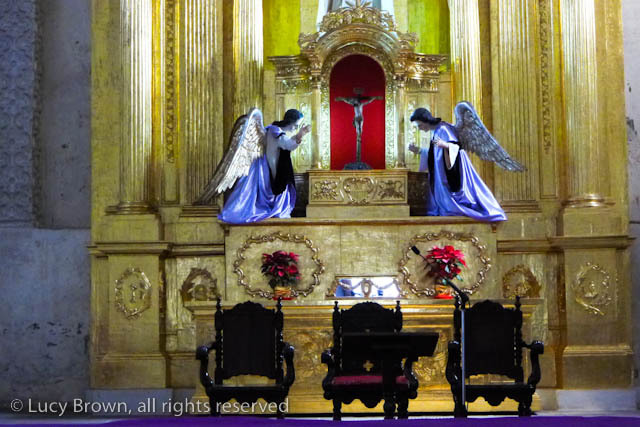 The following photos of nacimientos were all taken in the town of Antigua. 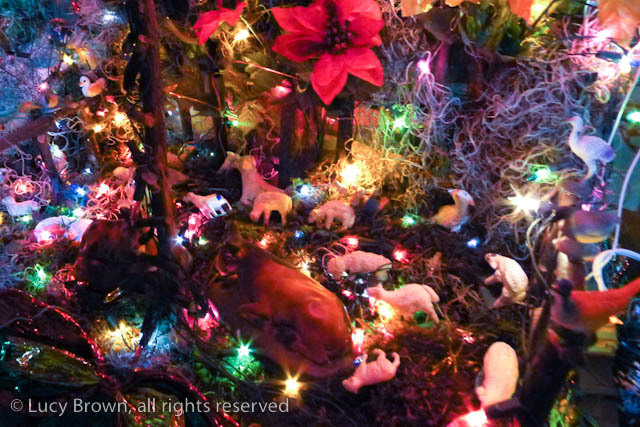 Baby Jesus is missing until midnight on 24th December. 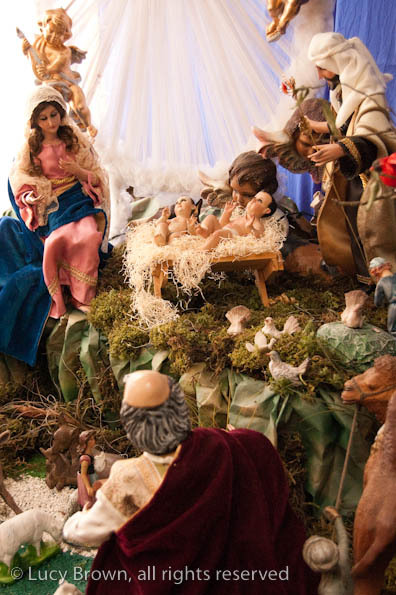 It is customary for the manger to remain empty until the figure of baby Jesus appears at midnight on the 24th accompanied by prayers and carols. 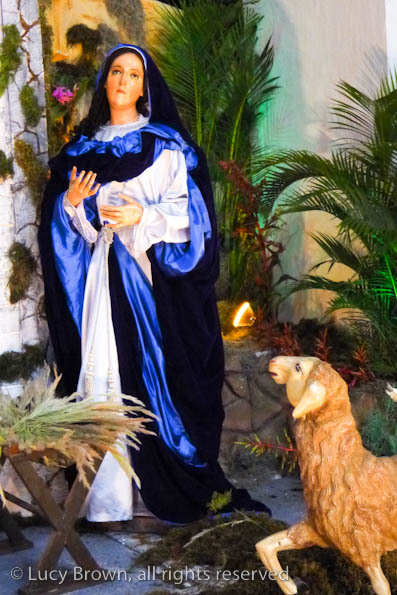 Close up of empty-handed Mary. Poinsettia (pascua) is the typical festive flower found everywhere here at Christmas. 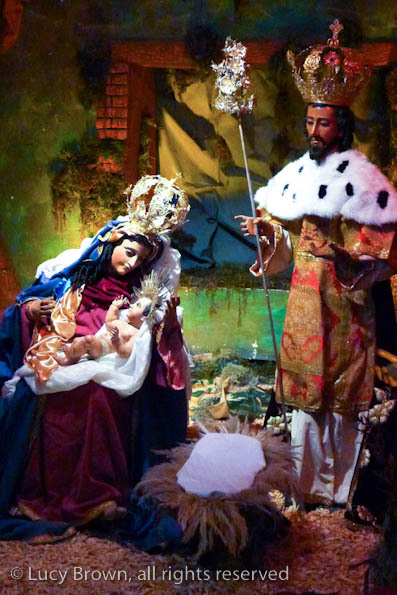 Crowned Jesus, Mary and Joseph. 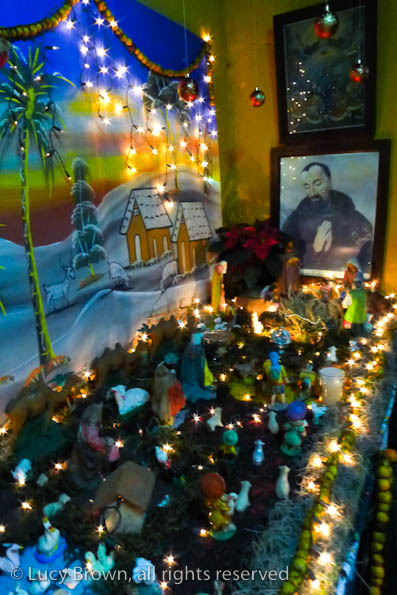 A simple nacimiento next to the Christmas tree. 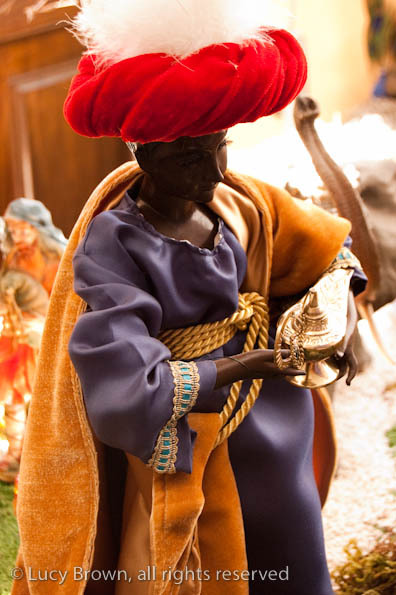 Hermano Pedro looks down on a nacimiento. Close up of the animals. One of the three wise men. 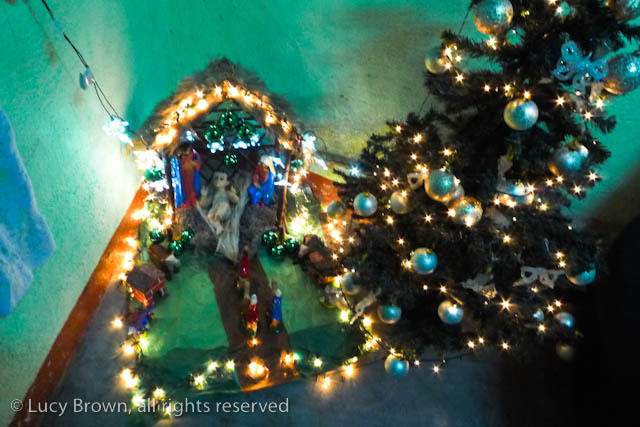 Close up inexplicably showing two figures of baby Jesus. 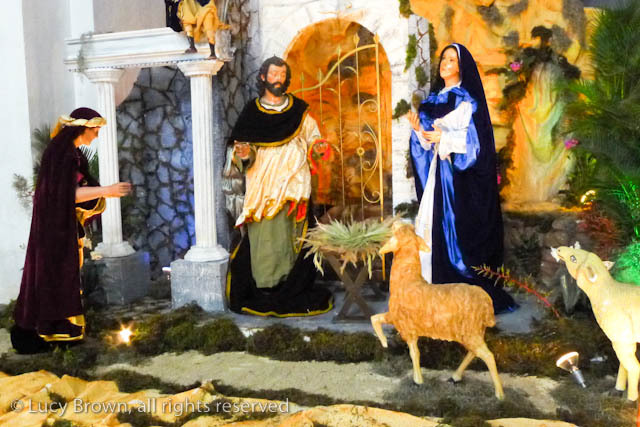 Another simple nacimiento lit up at night. The hats are a Guatemalan touch. 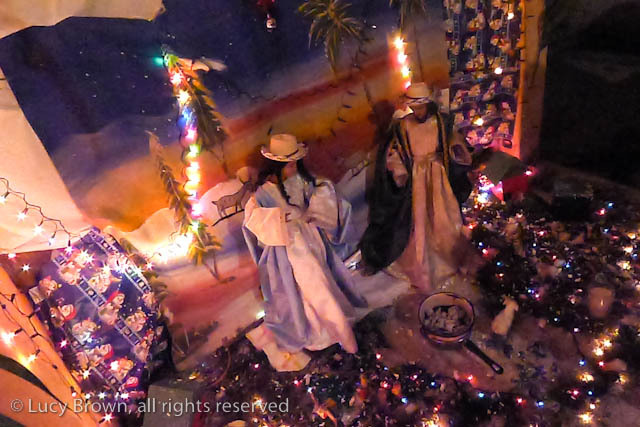 Nativity scenes are a worldwide custom but here it is not uncommon to see a touch of local flavor in the form of traditionally dressed Mayan figures and typical Guatemalan volcanic landscapes.